Thaw puff pastry on the counter, then put one sheet on top of the other and press the two together by rolling gently with a rolling pin until about 12x16 inches in size. Do not flour in between. Doubling the sheets will produce higher borders on the tarts. Cut out circles with a 3 inch cookie cutter. Try to cut them out as close as possible, leaving minimal amount of scraps in between. Remove scraps to a different aluminum or parchment lined baking sheet. Move each cut out circle about 1 inch from each other. Using a 2 inch cookie cutter, press it in the middle of the circle, almost all the way through. Whisk the eggs together for the egg wash. Using a pastry brush, brush the tops of each circle as well as the scraps that were leftover. I used a scrunched up paper towel, since I forgot to bring my pastry brush to the kitchen. Generously sprinkle tops of the cutout circles with granulated sugar. Bake in preheated to 425F for 15 minutes or until puffed up and golden in color. While the pastries are baking, make the ganache. Heat milk until almost boiling. Pour over the chocolate chips. Let sit for 2-3 minutes. Stir until smooth. Line a cup with a sandwich size ziplock bag and pour the ganache in. Make chantilly cream for the filling. Combine heavy cream, sugar & vanilla in a bowl of an electric mixer. Whip on high until stiff. Fill a pastry bag or a gallon sized ziplock bag fitted with a large star tip with the cream. Refrigerate until ready to use. Try to use within 15 minutes within making it. Line a large glass or a vase with the pastry bag fitted with a star tip (or a ziplock bag). Set aside. 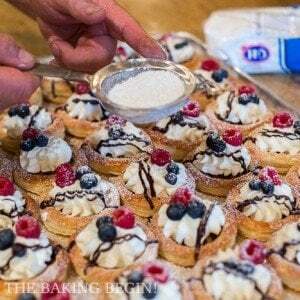 As soon as the pastries are baked and out of the oven, with your fingers or with a smaller cookie cutter, press in the middle to bring it down, leaving the sides as the borders to our pastries. Let completely cool. Bake the scraps as well. Snip off the end of the ziplock bag with the chocolate ganache and generously drizzle inside of the tarts, leaving about 1/4 of the ganache to drizzle later on top as decoration. Now place one raspberry & two blueberries on top. Using leftover ganache, make 2 quick lines down the side of each pastry. Right before serving, dust with powdered sugar for better visual impact. Refrigerate pastries until ready to serve. Once the scrap pieces are baked and cool, squeeze a dollop of cream on top. Stick 1 raspberry to each. Dust with powdered sugar right before serving. These pastries are best served cold, right out of the fridge. Now go ahead and enjoy!